"As more American volunteer fire fighting companies began to form during the late 18th century, a need emerged for better organized efforts to combat conflagrations. Engineers and officers would use “speaking trumpets” to amplify their voices over the noise and commotion of a fire scene to direct the company in effectively fighting the blaze. "Two trumpet variants are reflected in the collection: plain and functional “working” trumpets that were actively used at fires, and highly decorated “presentation” trumpets. Presentation trumpets were awarded to firefighters in honor of their service, or between fire companies during visits, competitions, and musters. The brass speaking trumpet (image from the Smithsonian National Museum of American History) measures 12 inches by 4.5 inches. The highly decorative speaking trumpet is an American Coin Silver Fireman's Speaking Trumpet, image from Heritage Auctions, Bailey & Co., Philadelphia, Pennsylvania. A closeup of the decorative mid-section of the trumpet shows the engraving from 1859. 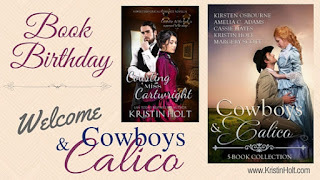 While writing my newest release, Courting Miss Cartwright, a novella contained within Cowboys & Calico--an anthology of five sweet western historical romances--I researched Speaking Trumpets. I wrote a scene where virtually everyone in town had gathered 'round a platform to participate in the Picnic Basket Auction to raise money for the Church Organ Fund. The crowd was loud. The officiator called for bids. Midst the laughter, good-natured ribbing of the hero (Rocky Gideon), and surprised exclamations, I realized pretty quick I needed a bullhorn. Or a megaphone, at minimum. My 1879 setting could not allow a microphone. I knew P.A. systems were out of the question, but who knew megaphones weren't designed nor called such until the mid 20th century? Some readers might not find historical inaccuracies a distraction, but many readers do. I do. I crave historical accuracy. So I put a speaking trumpet in the event official's hand and put him to work using it. The scene takes place in my heroine (Felicity Cartwright)'s point of view, so to make the likely unfamiliar term make sense to twenty-first century readers who know bullhorns and megaphones but likely never heard of a speaking trumpet, I showed its purpose, appearance, and Felicity's familiarity with it. This picnic basket auction scene occurs just one chapter from the ending, with some significant U-turns in the story, so I don't want to give too much away. But you can read the first third of that scene in my blog post: A Victorian Picnic Basket…worth $7.50? (And a peek inside Courting Miss Cartwright). 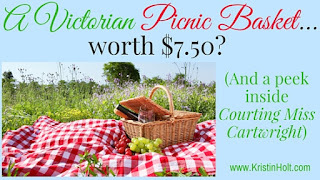 This post about picnic baskets and the import of picnics in Victorian recreation and courtship doesn't give too much away nor spoil the story. Note: $7.50 in 1879 more or less equivalent to $178.57 today. 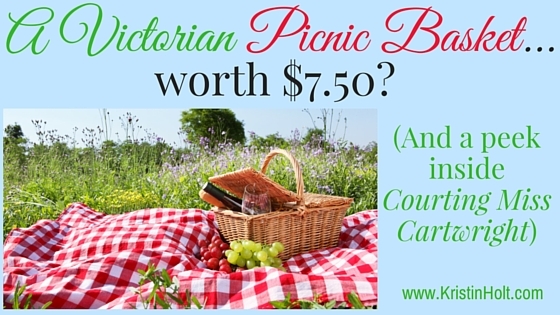 WHO spends nearly $180 on a picnic lunch? I'll introduce you to some of the key players in the opening scene of Courting Miss Cartwright. Four people, well, five, if we count the deceased father. 1-- Father. 2-- W.W. Stuart (Father's attorney), 3-- Felicity Percival [Cartwright](heroine), 4-- Rocky Gideon (hero), and 5-- Temperance Cartwright (heretofore unknown half-sister). One of them pays $7.50 in 1879 dollars for Felicity's picnic basket. And I'll give you one hint: Felicity doesn't buy her own. This set of Sweet Western Historical Romance Novellas was released last Saturday, July 30th. You'll find my contribution nestled in the middle of four well-loved authors: Amelia C. Adams, Cassie Hayes, Margery Scott, and Kirsten Osbourne. As of 8-3-16, the anthology has an overall average of 4.9 stars from 25 reviews on Amazon. Yes, it's an inexpensive set. Five NEW novellas for $0.20 each. Twenty cents! And it's a FREE READ with a kindleunlimited subscription. But I still want to give away TWO copies, one each to two lucky winners! All you need do to enter this FREE BOOK give-away is to reply to this blog post within 24 hours of its publication (From 12:00 AM on Friday, August 5th to 11:59 PM on Friday, August 5th--all PDT). In your reply, simply let me know what you think about Speaking Trumpets. Kind of cool that they're historically accurate? Have a hard time believing they work as well as a cheerleader-style Megaphone? Like the collector's item silver decorative one pictured in this post? Write something. Then don't forget to CHECK BACK (you may want to subscribe to the post). I'll post the winners HERE, in the comments section, just after midnight in the wee hours of Saturday morning (8-6-16). Winners need to provide me (privately) your email address, as Amazon requires it for me to 'gift' you a kindle edition of this book. This title will only be available for a few months' time and will only be in kindle edition. I think the speaking trumpets were a great idea. And they must have worked or they wouldn't have continued to use them. I always like picnic basket auctions in books, but wow what it is worth now is incredible. I always enjoy comparing dollar amounts, then to now. Thanks for entering the drawing for my two gift copies of COWBOYS & CALICO. Crossing my fingers for you! 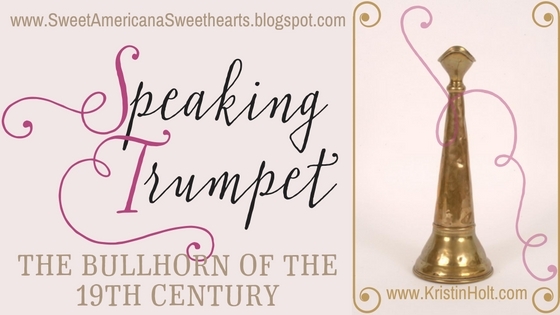 I think speaking trumpets are handy for what they were used for, like auctions or gatherings. Personally, I couldn't use one. Don't like public speaking. Thank you for the chance. Kristin, you astound me with your attention to detail. Good job with the speaking horn. And I know who bought Felicity's basket and how much was paid in 1879 dollars, but I won't give the secret away here. Hi Charlene-- Thank you for your kind words! Yes, indeed, you are in the know. About history, prices, and which character bought the picnic basket. Thanks for stopping by and for your kind support. Speaking trumpets are definitely from the correct era. Thanks for mentioning something that is basically unheard of anymore. Love chance to win! Thank you, guapodevera, for stopping by and commenting. It sounds like you know history and are familiar with speaking trumpets. You're right that they're basically unheard of anymore. I certainly knew nothing of them until I dug in a bit to how people worked around the problem of being heard in loud situations. I'm so glad you're interested in our Sweet Romance anthology! I have my fingers crossed for you. Love your post! Inaccuracies drive me nuts when I read. I caught one and just about died laughing. I showed the line(s) to several people and asked if they saw anything wrong. No one spotted it. When I told them the facts, they saw the humor. But as for those horns, now I know why I see that tall trumpet/staff-like thing on so many fire department shields. Thanks for the info! Thank you for your kind compliment. Like you, I genuinely care about accuracy in historical fiction. I've had way too much fun researching details for the Victorian Western Romance I write. I've never paid much attention to fireman shields or logos...I imagine I'd learn a great deal if I did! Thanks so much for stopping by and contributing to the conversation. Much appreciated! Many thanks, Angela/Doris. Your kind remarks and participation are so very welcome. Obviously a much needed tool before electronics. I love the engraving on the presentation speaking trumpet. I completely agree! It's amazing how a simple tool/device could make all the difference for firefighters (and event dignitaries). I thought the engraving on the presentation trumpet was remarkable, too. I'm glad you enjoyed this post about a bit of forgotten (for the most part) history. 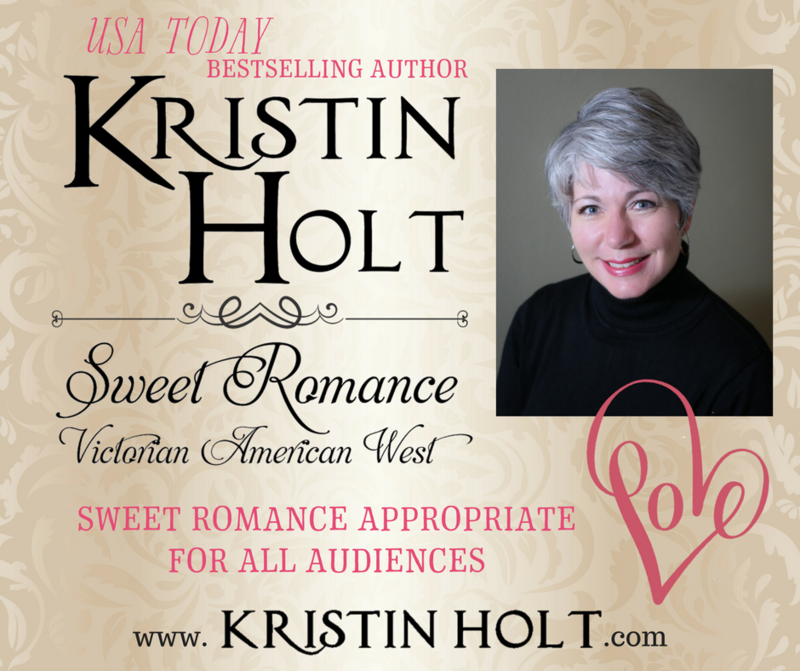 I'm so glad you're interested in the drawing for our Sweet Western Historical Romance Anthology. It's a nice set (I've read the other 4 authors' novellas, too)...and one I'm proud to have been a part of. I have my fingers crossed for you! 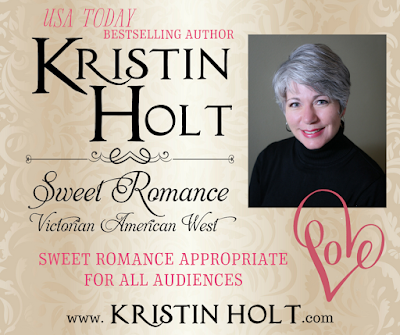 I'm so glad you're interested in the Sweet Western Historical Romance Anthology (Cowboys & Calico). =) I'm glad you liked hearing about a bit of history. I think speaking trumpets were a great idea. Even today, I have been to events where one would have been useful. Thank you for the chance. Thanks for stopping by. I agree--speaking trumpets were a great idea! Very Victorian, too. I'm so glad you're interested in Cowboys & Calico. I so enjoyed the other 4 authors' stories. And the fun researching history in preparation. I think anything that works is great. My husband refuses to wear his hearing aids. I'll use anything. I agree--if it works, use it! Apparently speaking trumpets were quite successful because they were around for almost a century before other devices (like megaphones) were invented. Why, thank you, Maria! Your name is definitely in the drawing! I love reading about Western Romance too. I think speaking trumpets were great things for SOFT spoken people. LOL....but for loud mouths!!!! Not so much! I do believe you're very right! THANK YOU, everyone, for your participation in this conversation, for entering the drawing for one of two kindle copies of COWBOYS & CALICO, a sweet western historical romance anthology. I used random.org to select the winners. I'm happy to report the two name drawn are Patricia Rose and Maxine #5215. Congratulations to Patricia and Maxine! Ladies, please provide your email address (per the original post on this blog) so I might send your kindle edition prize to you through Amazon. You're welcome to email your (email) address to me (Kristin at KristinHolt dot com) OR PM me on Facebook (Author Kristin Holt). I'll award your prize as soon as possible upon receiving your email addresses. Thank you, everyone, for entering and for your interest in Sweet Romance. I've successfully awarded Patricia Rose's prize copy, but not Maxine #5215's. If anyone knows Maxine, please nudge her to contact me (see post announcing winners on 8-6-16 at 6:19 AM). Thank you! Thank you, Angela-- you're a gem. Bustles and Bustle Benches ... Oh, My!